While Zebras Watch Our Blocks Blow by Blow! The day was Saturday. The weather was unpleasant. The head was fuzzy. The Lightfoot Centre in Walker was still an insane-looking seventies contraption. Except about 25 degrees colder than the last time I’d been there. The reason for my voluntarily leaving the house on a cold, drizzly weekend afternoon, when I would otherwise have been reclined on my sofa taking in the day’s football news with a variety of savoury snacks? 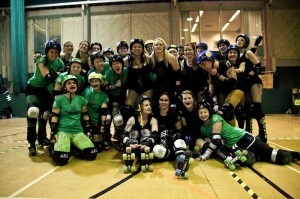 There could be only one: the latest Newcastle Roller Girls home bout. It had been a while since my brief foray into the brave new world of roller derby, and bearing in mind that foray had been, well, a bit pants really, bearing in mind it consisted a great lumbering oaf (me) trying to remain upright on four wheels, I was chomping at the bit to see the professionals in action. The atmosphere was jolly and the day started with a reminder of the rules of the sport which was a welcome relief as I’d gone a bit blurry on them if I’m honest, but I quickly remembered they involved women crashing into other women, women creating moving walls, women using one another as weapons, and similar such fun. And so to the B team bout, which was to whet the appetite for the Christmas feast on offer that afternoon. I’d like to state how impressed I was from the outset. There is a real depth to the NRG squad now, which becomes apparent when you see they have enough skaters for two credible sides to take one another on before you even get to the main team. Also the quality of the second string skaters compared to the last time I was in attendance has vastly improved. Sleigh Belles vs Christmas CrackHers. Just out of shot, Santa has been spotted. Naked. A celestial Miss Wired has seen the jamming light! That said, it was still delightfully mental. There was a lot of squawking, and some exceptional crashes and pile-ups, but aside from the odd one being caused by a person tripping themselves up, they generally came off the back of an excellent check or block, so well done those girls. Uberschnell in particular did some good jamming (check my technical terminology) picking up bucketloads of points for her team. I spent some time trying to figure out penalties but didn’t do very well. For some reason it always seemed as though the person who was wronged was sent to the sin bin rather than the aggressor. Perhaps my eyes just weren’t quick enough to register the myriad things that were going on at any one time. 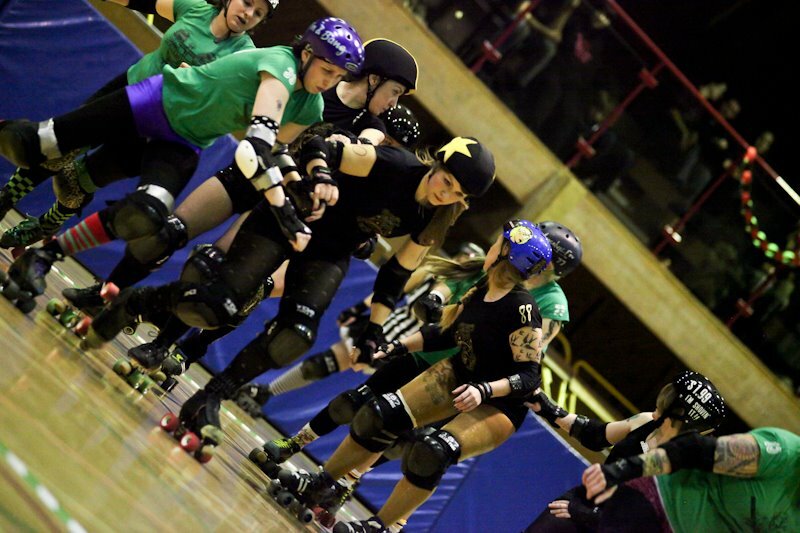 Or maybe roller derby takes a dim view of people tripping and getting in the way. How very dare they! Aside from that I felt more comfortable with the rules, although I must say there was an odd-looking starting position which I didn’t quite understand, the four blockers from one team kneeling down on the start line in formation, as if they were about to have a team photo taken. 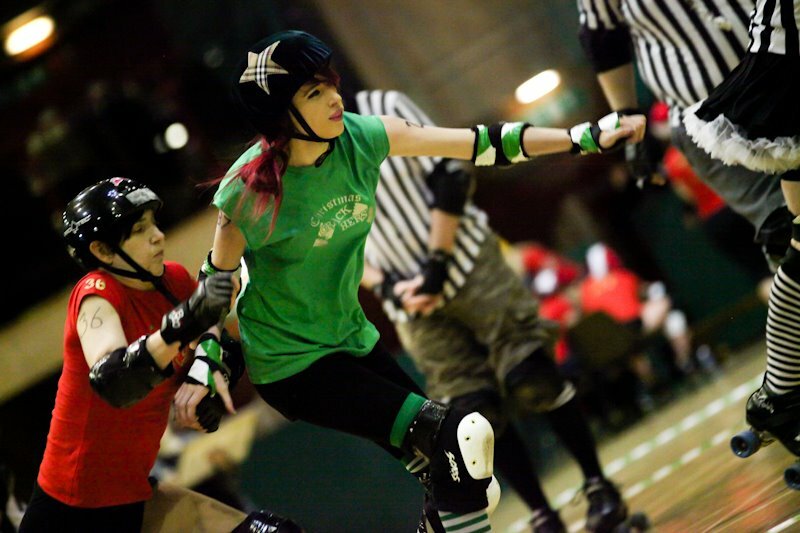 It wasn’t very effective as the jammer nearly always broke loose immediately, skipping over the collection of sluggishly arising blockers and making her way to some points. 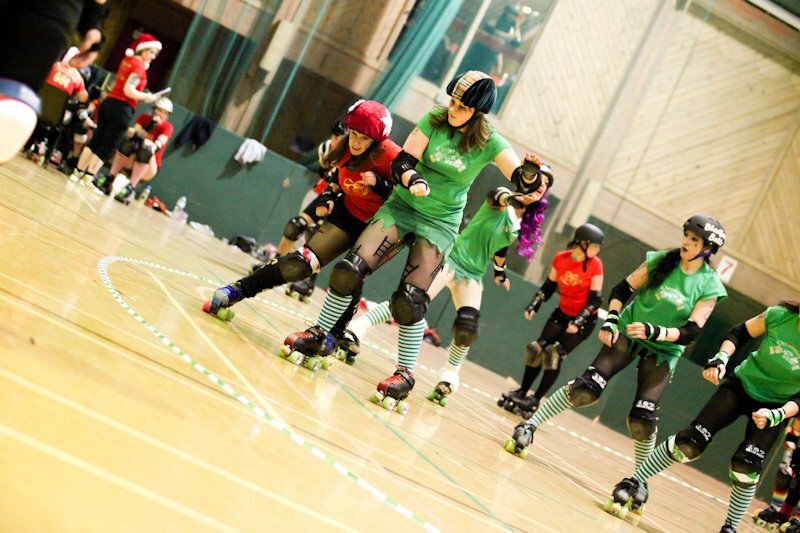 The bout ended with an injury but it didn’t look too serious; the victors were the Christmas CrackHers (ba-dum tshhh) narrowly beating the Sleigh Belles. There was a bit of a love-in and then we were on our way to the main event, which followed a ‘surprise game’ involving wrapping up audience members like Christmas presents – well why not. We opted for ground level viewing, protected from the action by nothing more than a wooden barrier – it was to be like trench warfare, with glitter. The skaters from NRG took to the track to warm up looking fierce, and exceptionally thin I might add, and received a Hollywood-style introduction which was no less than they deserved. The Cannon Belles did a sort of group chant/ raindance/ meditation. The atmosphere built and we were underway. It was a cagey start, the two teams ranked 6th and 14th respectively (the Scottish team the higher ranked) feeling each other out early on (oo-er). But there wasn’t much time on the clock before GG Fox and vice captain Von Sleaze picked up the Canny Belter’s first points, the latter taking advantage of the ‘team photo’ start adopted by the Cannon Belles, similarly ineffectual as it had been in the prior bout. They’re canny. They’re beltin’. And oh my, are they fabulous. Hollywood entrance by the NRG girls. I daydreamed about how cool it would be to be a jammer. I defy you to watch roller derby and not want to be one. It’s the roller skating equivalent of being head cheerleader. Or the one at karaoke who can actually sing. I mean, seriously. You get to wear a star on your helmet, and if you’re faster than your opposite number, you get your very own referee skating around the inside of the track pointing at you with his arm in the air. Your very own man telling you ‘you’re the best! Yeah!’ whilst you zoom serenely around the track, protected by a bevy of lovely ladies, picking up points for your team and making everyone cheer. And with a wistful sigh, I’m back in the room. I’ll simply never be that cool. 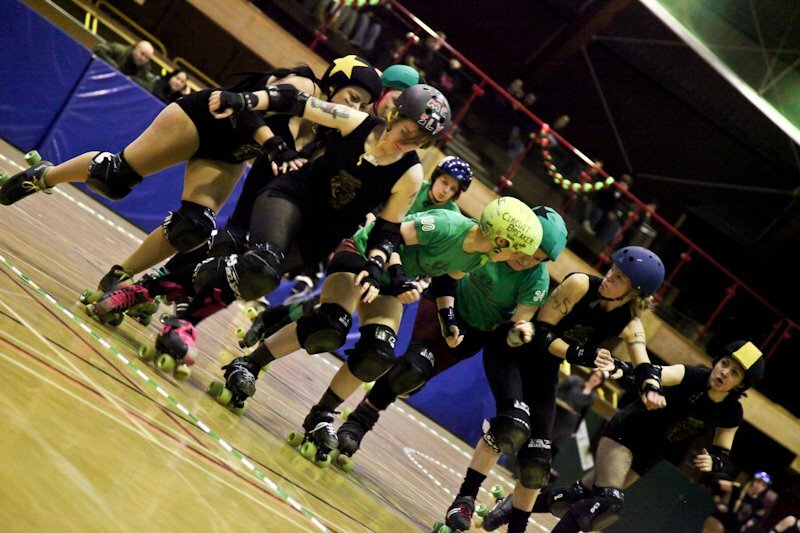 The bout was noticeably more tactical than the B team affair had been, with lots of very slow starts and tense exchanges between blockers and jammers. And penalties, boy were there a lot of those! Some of them were self-explanatory, for example Von Sleaze tripping the opposition jammer when she was clean through and about to start picking up points – the equivalent of a trip in the box in football. Lucky there’s no red card. She came on and proceeded to get sent straight back off again. In fact the vice captain appeared to be carrying out some kind of bet as she amassed at least six penalties that I can recall. I wonder if she won the bet? She’s a dirty girl, nonetheless. She’s quick, she’s hard, she’ll drop you on your arse, Von Sleeeeeaze! Von Sleaze! 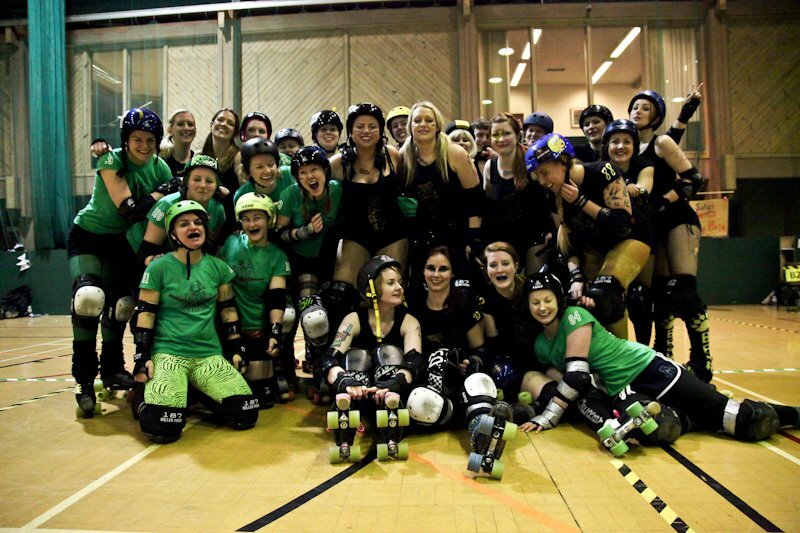 Aside from all the misdemeanours there was rampant point-scoring going on, GG Fox picking up some more along with Bettie Basher, who was living up to her name and throwing some quality hits, and the Canny Belters streaked into the lead (oo-er). 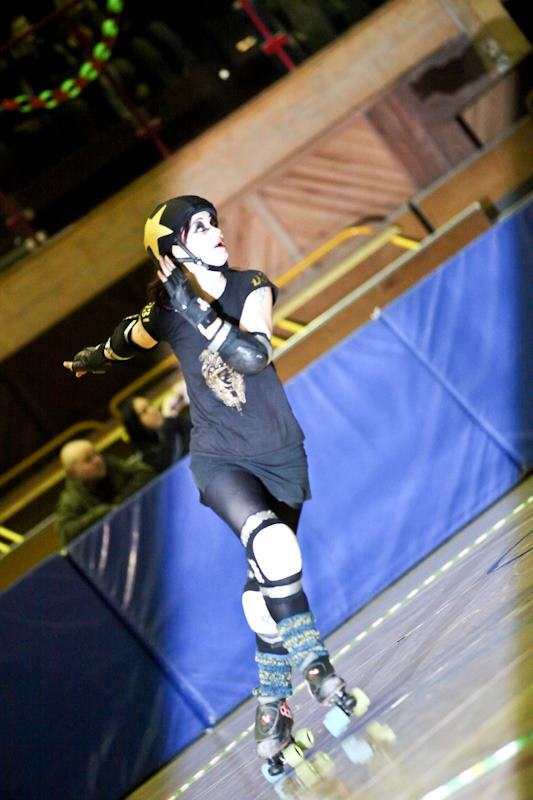 But shortly after, Kaos Moss picked up a bucketload of lovely points for the Cannon Belles and the visiting side clawed their way back into the bout. Then there was another intriguing blocking tactic in which the Canny Belters performed a kind of limbo. This was much more effective than ‘team photo’ start as the opposing skaters all fell over. Captain Brie Larceny jammed her way to another couple of points and the home side crept back into the lead. In the early part of the first period the scoreline remained tight, the two teams trading the lead for a while, until the turning point came, with some minutes left in the first period (I was far too enthralled to be looking at any damn clock – there were scantily clad sportwomen zooming past my very eyes for crying out loud! ), when GG Fox picked up a staggering 17 points on the powerjam to take the Canny Belters leaping into the lead by the halfway point. The second period was delayed due to Big Smack and Fries having some helmet trouble (oo-er). This time was passed pleasantly by the girls; there was singing and dancing on the start line and generally being friendly and such. I don’t know if it’s a case of too much ice hockey but I do wish they’d be a bit more aggressive at times. Even during altercations they remain pally and well, you know, a bit of a strop and a punch in the arm wouldn’t go amiss once in a while, know what I mean? Okay it’s official, I watch too much ice hockey. I’ll try to stop myself from yelling ‘bench clearance’ next time. Although I’m willing to bet that Von Sleaze would be up for it. That’s not to say there isn’t physical contact. Oh no, there’s plenty. Hip checks and shoulder barges are the order of the day, and I definitely spotting some mounting going on early in the second period. Anywaaaay. Oh yes, the action. I knew I was supposed to be doing something other than talking about sporting violence and making childish euphemisms. The Canny Belters had a commanding lead as they entered the second and the imperious GG Fox picked up even more points early on (what did they put in HER Lucozade? ), followed by Bettie Basher in her incredible gravity-defying top, almost – but not quite – displaying more than just her bodacious jamming skills. Hot on her heels, Von Sleaze burst from the traps like a bullet from a gun to collect more points, taking the NRG girls’ score to over double that of their opposition and place them firmly in the driving seat (oo-er. Oh wait, that one wasn’t rude. Double entendre fail). CAUTION: Mounting may occur at any moment. Stand well clear. The Cannon Belles’ key jammer, Kaos Moss, finally managed to chalk up a few more, despite looking a bit on the tired side (I’ll be honest, she looked wrecked, but she was being used heavily by her team so it’s hardly surprising), before NRG’s fabulous Miss Wired came into her own. Probably the best skater on the team, to these novice eyes at least, with amazing poise and speed and mind-bending balancing skills, she made fools of the opposition, FOOLS I say, to pick up 10 points in one jam and a smattering of points across a number of other jams. She’s so dreamy. Fittingly, Captain Brie Larceny took the NRG score past the 100 mark and there looked to be no way back for the visitors. Then things started to stretch out as skaters tired; there were powerjams aplenty (remember, they’re when one team is a man down so the other has a better chance to pick up points. Nothing to do with concentrated strawberry preserves OR a rocking guitar practice session) and these seemed to change hands constantly as skaters came and went from the penalty box, keeping the seats warm (it was bloody freezing in there) and causing a constant shift of power from one team to the other. The visitors used these valuable opportunities to rack up a few more points and an unlikely comeback could have been on the cards, but even as the thought was considered the score swung back in the Canny Belter’s favour, Von Sleaze, Miss Wired and Marie Bayonet picking up enough points to surely take the contest out of reach. A last gasp opportunity for the Cannon Belles arose as three Canny Belters found themselves warming one another’s cocklese in the Sin Bin (oo-er) and a strong final jam for Kaos Moss picked up an additional 9 points but it was too little too late. The bout was over, the score confirmed at 117-84. And so it was over. It had been a journey. A deeply stylish, warm and fuzzy journey. With added innuendo. And elbows. And to the victors, the spoils. The girls and their baying fans made their way to the after party for copious amounts of festive cheer in liquid form. Here’s to a great win and another cracking afternoon’s entertainment – now onwards and upwards for the Newcastle Roller Girls. PS Did I mention that Sniper Viper was mint? Because she so is.